After discussing about classroom newsletters with fellow teachers - on my district and through social media - I've decided to offer my two cents about it.....and here I go! 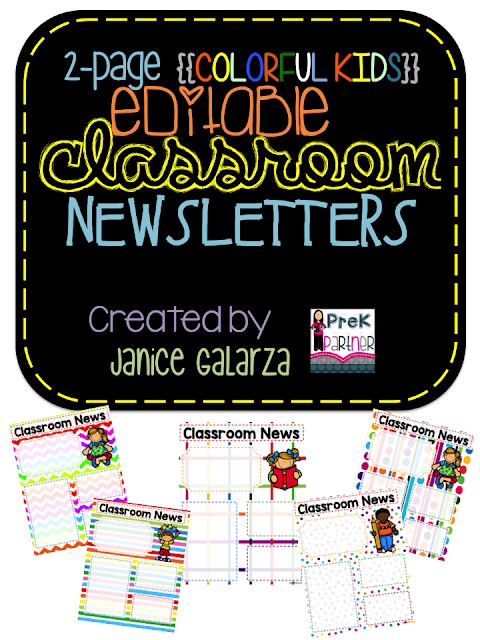 The main purpose of a classroom newsletter is to maintain parents and caregivers informed of the classroom happenings, and having them involved in their children's education. I personally love newsletters and the channel of communication it opens between home and school. 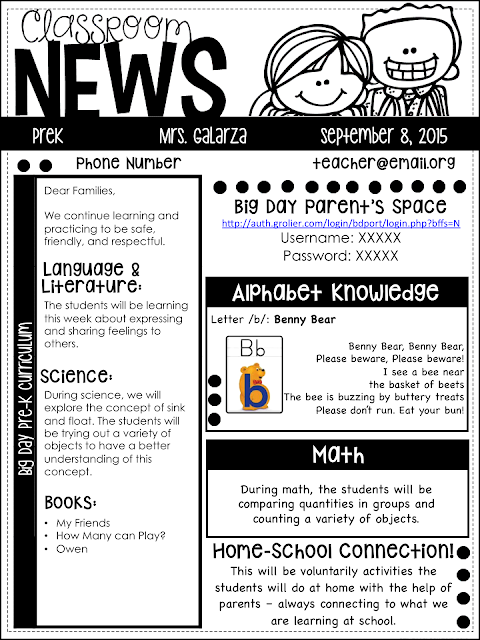 Classroom newsletters can be as fancy or as simple as you'd like. The important part is that the information posted on it is clear, specific, and easy to read. t also must provide a valuable insight of what the students have learned and will be learning. In my weekly newsletters I include curriculum information - specifically math, and language and literacy. I also include my contact information, a home connection project (once a month), and any other important information for the upcoming week. Teachers should also consider the students' home language when writing a newsletter to send home. In my case, 95% of my students' home language is Spanish - therefore I send home my weekly newsletter in Spanish as well. This is my English version of the newsletter that my families received this past week. The responses have been very positive. The families enjoy it and look forward to learn more about our days. In case you decide to give it a try or if you're looking for an editable format for classroom newsletters home, grab this weekend FREEBIE! It wasn't useful for our understudies. Furthermore,MUT it positively wasn't useful for our more defenseless custom curriculum understudies. I ‘d mention that most of us visitors are endowed toadmission in class 11 in cbse school in delhi exist in a fabulous place with very many wonderful individuals with very helpful things.